Review posted May 30, 2015. National Geographic, Washington, D.C., 2015. The text of this book talks about all friends can do and be. The photographs make it shine. 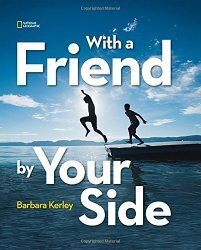 Barbara Kerley catches the sparkle in the eyes of friends having fun together. Looking at the pictures, you’ll notice she’s got all skin colors represented, and friendships between people of all different shapes and sizes and ages. But the pages at the back really bring it home. She’s got a world map and tells where every photo originated. They are truly from all over the world. Some of my favorite photos are Clowning around in Bamako, Mali, Slip sliding down a muddy hill near Jakarta, Indonesia, Getting ready to fly in Pacific Palisades, California, U.S.A., About to get wet in Lake Cerknica, Slovenia, and Cozying up to a good book in Sarsy, Russia. This book is a work of art celebrating people – celebrating Friends.